Reading in the Wild: The Book Whisperer's Keys to Cultivating Lifelong Reading Habits by Donalyn Miller with Susan Kelley. Adult (professional development). Jossey-Bass, November 2013. 273 pages. Review copy purchased. I just finished the amazing professional book Reading in the Wild by Donalyn Miller, a.k.a. The Book Whisperer, and Susan Kelley. 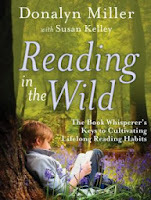 Having read and loved The Book Whisperer: Awakening the Inner Reader in Every Child a few years ago, I was very excited when I saw that Donalyn Miller had another book about reading coming out. You may know Donalyn from her monthly #TitleTalk Twitter chats or her fabulous blog. She is a reading teacher in Texas and reads voraciously in order to advise her students and create lifelong readers. This book examines five habits of lifelong readers and what teachers can do to instill these habits in their students. Dedicating time to read: making reading a priority and finding spare minutes in our busy days to dedicate to reading. Self-selecting reading material: not relying on a teacher or boss to dictate reading, but knowing what we like and how to find our next read. Sharing books and reading with other readers: whether it's a monthly book club, casual conversations with friends, or contributing to social media like GoodReads or Twitter. Having reading plans: knowing what we're going to read next and/or setting reading goals. Showing preferences: being aware of what we like in a book so that we can find other books that we might like. Miller's introduction is a smorgasbord of research-based information about why reading matters. Part of the librarian's job is to match readers to the right book at the right time. If you're making a case for starting a readers' advisory training program (possibly like the Reading Wildly program I'm doing with my staff) or bringing in a trainer or attending a conference or webinar to develop your readers' advisory skills, you definitely need to check out this book. I highlighted many sections to share with my staff about the importance of reading teachers (and anyone in a readers' advisory capacity, definitely including librarians) reading widely themselves. Over and over again, Miller emphasizes the importance of reading widely, of valuing students' choices, of the readers' advisory interview (what she calls conferring and providing preview stacks). One of the five habits that Miller discusses is making a reading plan, and she includes the "Books to Read List" that she uses with her students. This is something we could easily provide in the public library, leaving blank copies for patrons to take or distributing them when we visit for booktalks. The Books to Read List enables patrons to keep track of the titles that have piqued their interest so that they have a reading plan, somewhere to start when they finish their current read. Miller emphasizes the importance of student choice in reading over and over again. She also asserts that students who have a reading goal over school breaks tend to read more. Some public libraries allow patrons to set their own reading goals for the Summer Reading Club. Even if you don't want to take that plunge, maybe encouraging families to set their own informal goals for the summer before school ends might encourage them to follow through and join the Summer Reading Club. A child might want to finish a series he's started, read a certain number of pages, or try a genre outside his comfort zone. If kids have thought about where they might start, it makes those trips to the library more manageable. One very cool idea Miller suggests is talking about and writing down "reading resolutions" for the new year. This could make an easy and fun interactive display or self-directed program. Provide large post-it notes for patrons to jot down their own reading resolutions for the year and post them up on a bulletin board or designated space. Writing down a goal and posting it for the world to see may help patrons reach their goals, too! And patrons' reading resolutions might give you a better idea of your community's favorite genres and series or recommend programming ideas to you. Of course, Miller has seen struggling readers come through her classroom, and she suggests techniques and resources for helping these kids develop a love of reading. Kids who struggle to finish books might enjoy collections of short stories because finishing a story can give them a goal they can meet and a feeling of satisfaction at completing something. Miller also recounts her journey towards acceptance of graphic novels as legitimate literature (not just a gateway to "better" novels). These are some of the ideas and inspirations I got from Reading in the Wild. I'm sure every reader will glean something different from this wonderful book. If you serve school-age kids, don't let yourself miss it!